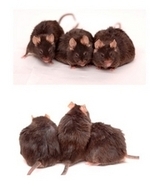 Posted byDave the Wine Merchant	 November 4, 2006 6 Comments on Great news for fat mice!! While driving the wine road this week I got a call from an astute customer telling me he wanted to order 100 bottles a day in order to be healthier, "just like those fat mice." Huh? As I was about to say "What the…?! ", he began to explain the new study burning up the wine-blogosphere. It seems some scientists thought it a good use of grant money to study mice made obese by a high-fat diet (left). In the Associated Press article, one of the scientists referred to this diet as "A McDonald’s diet", but out of respect for the hard working dietitians at Big Mac HQ, I’m not going to make such a reference. Yes, there is a downside. For humans to enjoy the same benefit we would have to ingest a daily dose of Resveratrol equivalent to the amount found in 100 bottles of red wine. The drug industry is hoping to come out with a pill containing this much Resveratrol, if further studies warrant it. I call it "The 100-bottle equivalent pill." A PILL? What fun is that? Well, more fun than drinking 100 bottles a day, but let’s not quibble. (Yeah, I know, the old drinking song came to my head too – get rid of it NOW, or you’ll hear it all through your next two meetings). But still, wouldn’t it be nice if the drug manufacturers came out with a Resveratrol tablet containing the equivalent of 99.5-bottles? That would be shy of our required daily dosage by two glasses of wine – the amount deemed most healthy in such reliable sources as "The Wine Lover’s Healthy Weight Loss Plan " co-authored by a chef and a Cardiologist (read my interview with one of the co-authors, here). In reviewing the online article about the chubby-but-healthy mice, one line caught my attention – "Resveratrol is produced when plants are under stress". Hmm. No wonder it is found in wine. I wonder if it is found in higher concentrations in grapes from low-yielding, mountainside vineyards with poor soils that have been dry-farmed. It’s long been known to winegrowers that a stressed vine produces superior wine grapes. Maybe, just maybe, there’s a connection between great health and great wine. Wouldn’t surprise me. Schoeneman, 2002 Pinot Noir, Ferrington Vineyard, $16 An most inexpensive and pleasurable pinot from the owner of the famed Ferrington Vineyard. Pietra Santa, 2001 Sassolino "Super Tuscan" $18 This Sangiovese/Cabernet blend is drinking beautifully now, after five years of bottle age. Likely at or near its peak and ready for immediate enjoyment. Andrew Murray Vineyard – 2003 Syrah, Santa Ynez Valley "Estate Grown", $25 This wine received great product placement in the movie ‘Sideways’, and is getting difficult to source! Buy it now while we still have some. Tudor 2004 Pinot Noir, Santa Lucia Highlands , $39 This Dan Tudor wine was recently featured by the glass at Chicago’s famed Everest Room. I think the price was $16 per glass, which makes $39 for five glasses a relative bargain. Arcadian 2001 Robert O. Fleming Cuvee Syrah, Gary’s Vineyard , $50 I realize this may not be most people’s idea of an everyday source for Resveratrol, but we need the substance on special occasions too! And this is a wine for just such days. As elegant a Syrah as has ever been made. 300 Million?? Is there enough wine?! Interview with Jerome Poiret of "Clef du Vin"
This article made quite an impression – in fact it was the topic of conversation at the cocktail party I attended on Saturday evening. Well I was so impressed by article and the impact it made on my friends that I spent Sunday afternoon in a bookstore browsing through the Wine section. Since I’m a novice at wine selection (which seems to be a fine art) I made sure to pick up at least one “cheat sheet” in addition to a more coffee table-style book about the history of red wine. My cheat sheet of choice was Secrets From The Wine Diva by Christine Ansbacher. I finished it in a night, doggie-eared some pages and slept on what I had read. The next night at dinner I felt like a pro ordering a selection that even my client was impressed by. It was like magic – a highly recommended read. Get healthy and drink happy – cheers! Nice wine blogs and give price of wines that are good for wine buyers. Not only does the diet work well, but the recipes are fantastic! Not easy-cook, for the most, but worth using for special meals. And the rest of the time, just follow the chapters on the foods to use or not use. I’m glad I bought this book!